Here’s a quick look at Woody Harrelson in costume as he shoots scenes for the upcoming Star Wars solo movie, the untitled Han Solo movie. The new movie was formerly directed by THE LEGO MOVIE directors Phil Lord and Christopher Miller but they were eventually kicked out of the project due to ‘creative difference’. Some sources that they feel like the duo is turning the should-be-serious Han Solo movie into something that resembles Jim Carrey’s Ace Ventura Pet Detective. 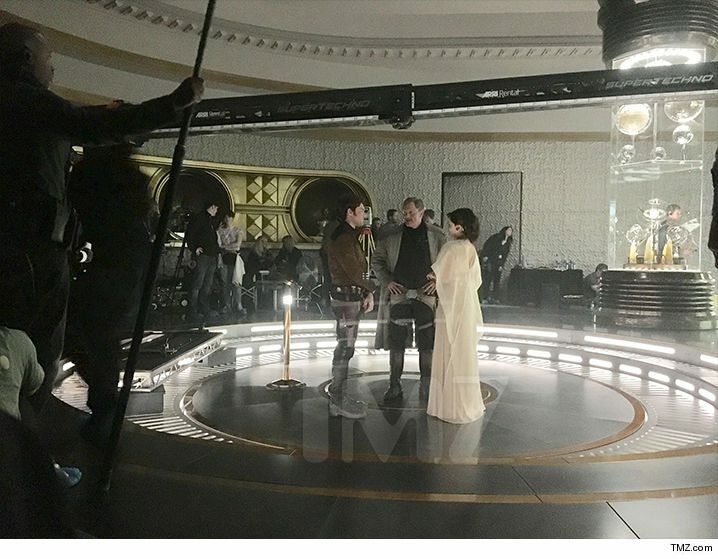 Now TMZ shares two more photos and a video featuring Alden Ehrenreich as the young Han Solo together with Chewbacca and a Harrelson who plays the character Beckett, who is rumored to be Solo’s mentor and father figure. We still don’t know who the woman dressed in white is but the rumors are suggesting that she’s actually Game of Thrones star Emilia Clark. Honestly, I’m pretty sad that we’re not getting anything like an official photo or anything. Heck we don’t even have an official title considering that at this point Rogue One was being already referred to as “Rogue One” and not “untitled Star Wars prequel”. Before my rant goes any further, let me repost the video that was “stolen” from the set of the Ron Howard Untitled Han Solo project. 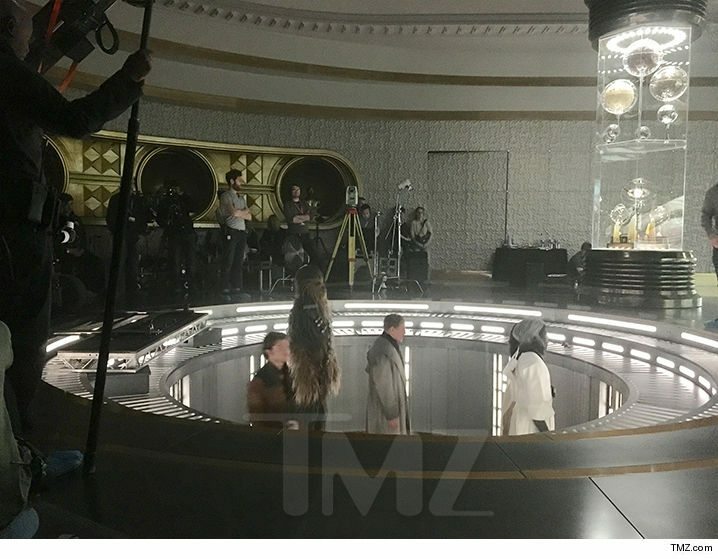 Here’s another look at Alden Ehrenreich as Han Solo. 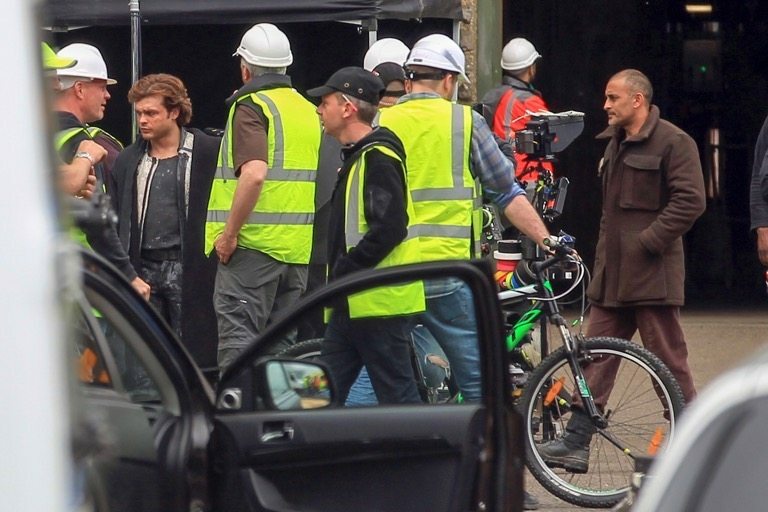 Alden Ehrenreich, who plays the young Han Solo in the upcoming spin-off Star Wars film, is seen on set for the very first time in costume as filming commences in the UK. As well as a number of extras, Diego Luna, who played Cassian Andor in the 2016 Star Wars movie Rogue One, was also seen on set. Editorial Rights Managed Image – Please contact www.INSTARimages.com for licensing fee and rights: North America Inquiries: email sales@instarimages.com or call 212.414.0207 – UK Inquiries: email ben@instarimages.com or call + 7715 698 715 – Australia Inquiries: email sarah@instarimages.com.au or call +02 9660 0500 – for any other Country, please email sales@instarimages.com. Image or video may not be published in any way that is or might be deemed defamatory, libelous, pornographic, or obscene / Please consult our sales department for any clarification or question you may have – http://www.INSTARimages.com reserves the right to pursue unauthorized users of this image or video. If you are in violation of our intellectual property you may be liable for actual damages, loss of income, and profits you derive from the use of this image or video, and where appropriate, the cost of collection and/or statutory damage.